Technically, any of the four modes will work—just with varying degrees of success. Choosing the correct mode will produce the best results in terms of efficiency, data resolution, accuracy, etc. The most prominent determinant of whether to use the Handheld Rapid Scan mode is speed. When scanning large objects with rich features that don’t require high precision or accuracy. The EinScan-Pro Handheld Rapid Scan uses speckle projection and can support both marker point and feature alignment. Large-scale sculptures, automotive bumpers, human forms, organic shapes, furniture, etc. The handheld rapid scan mode can capture an entire human body quickly and expeditiously (except for hair). During the scanning process, it’s important that a) the model remains motionless, b) we keep the optimal scanning distance and c) we scan with a smooth, steady and continuous motion. It takes about 20 minutes to scan an entire human body. When choosing between the two handheld modes, we recommend selecting the High Definition mode if the object is richly detailed and difficult to move. Although the HD Scan mode requires the use of Markers, it offers convenience with highly detailed, precise results. 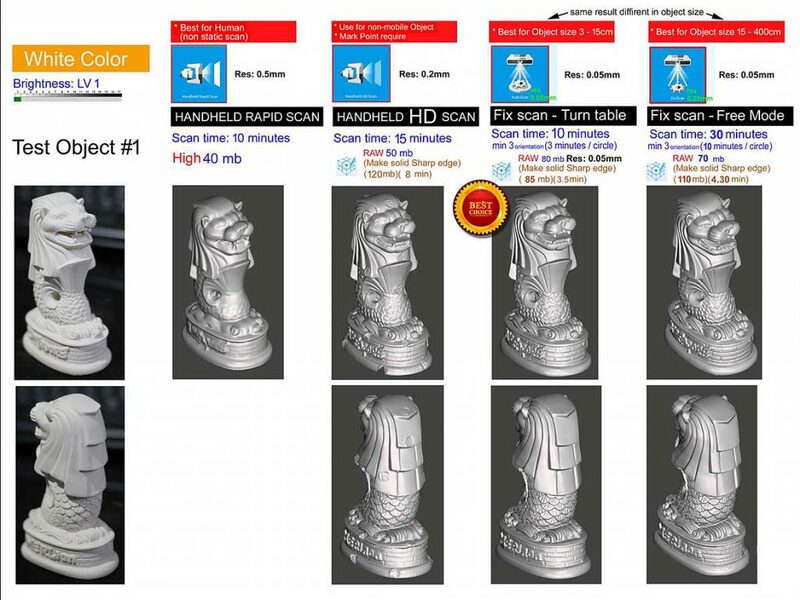 The handheld HD scan mode utilizes white light scanning which is highly suitable for large sculptures, automotive parts, castings and so on. The richly detailed Vunes sculpture is large (55cm high) and difficult to move. To scan this object our best choice was the Handheld HD scan mode. The main criteria for selecting Automatic Scan Mode is the object’s size. Automatic Scan mode is suggested when the object is less than 20cm. This mode can be used for industrial components, ornaments, small artistic pieces, etc. The Automatic Fix Scan-Turntable accuracy is 0.05mm for a single pass. Automatic Scan is the best choice for the small (50x50x150mm) peanut model (shown right), completing the scan and creating a high-quality model in about 3 minutes with rich and vibrant details on the surface of the model. In the Fix Scan-Free mode, there is more flexibility than with the Automatic Fix Scan-Turntable because it’s possible to scan larger objects up to 4 meters in size. Recommended for large, complicated workpieces and richly detailed sculptures (accuracy 0.05mm). Preferably, objects are lightweight and easy to move during the scan process. 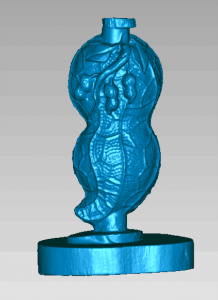 If the object has enough details, the EinScan-Pro will automatically align multiple scan meshes to form a perfect 3D model. Experienced users gain their best results by manually controlling the number of scan passes. If the object is cumbersome, heavy or difficult to move, then choose either the Handheld Rapid Scan or the Handheld HD (High Definition) Scan. 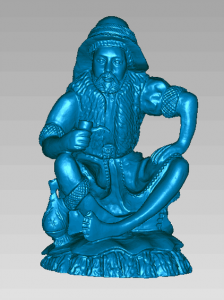 This elderly man statue model (shown right) is 240mm in height and exhibits a richly detailed surface, making it perfect for the Fix Scan-Free mode. During the scanning process, the object is placed in different orientations to ensure that no details are missed. Each new scanning pass must overlap the previous pass by at least a third to ensure coverage and mesh alignment. When all the multiple scanning passes are complete, the EinScan-Pro automatically aligns and merges the separate meshes together with high precision.